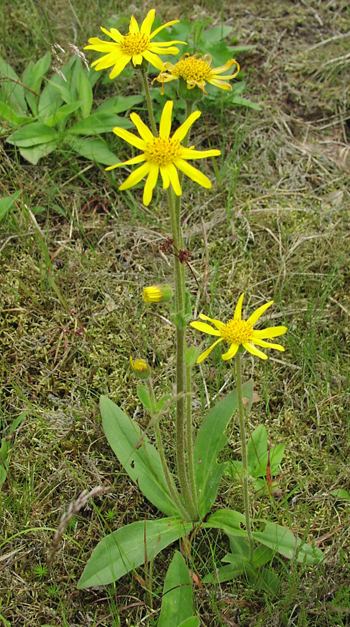 Arnica is a perennial plant; the horizontal, brown, branched rootstock sends up a slightly hairy, simple or lightly branched stem that reaches a height of 1-2 feet. The basal leaves are oblong-ovate and short-petioled; the upper leaves are smaller and sessile. 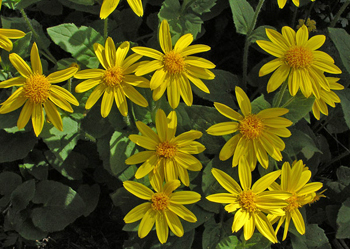 Each plant has 1 to 9 large, yellow, daisy-like flowerheads, 2-2 1/2 inches wide, whose rays are notched on the outer tips. The flowers appear from June to August. Other varieties: A. fulgens, A. sororia, A. cordifolia, etc.